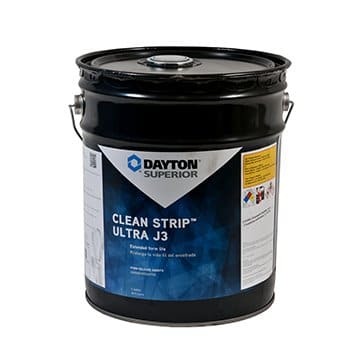 Product Description: Dayton Clean Strip™ Ultra J3 Form Oil is a chemically reactive form release, that is ideal for architectural and precast concrete and for general forming applications. Clean Strip Ultra J3 works to ensure clean, positive release of plywood, fiberglass, aluminum, steel and other concrete forming materials. Coverage up to 2,000 sq.ft./gal.